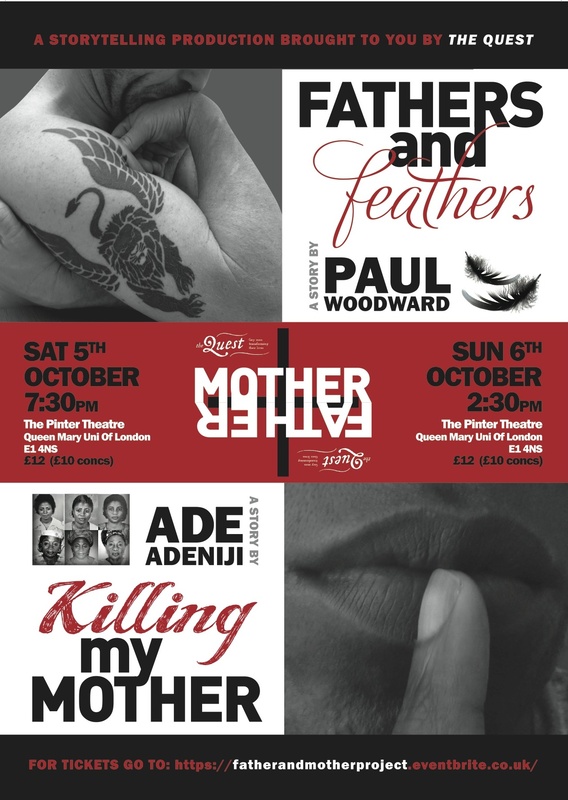 Ade: I’m really excited about our upcoming Fathers+Mothers storytelling performance. What was your inspiration for collaborating on the piece? Paul: To be honest I’ve never considered myself a performer… I’d say I was a director and dramaturg first and for most.. but through a variety of chances and circumstance I found myself working in Melbourne with the legendary performance storyteller and gay activist Tim Miller from the US on an ensemble storytelling piece about bodies and memory… I performed a short piece about my relationship to my father’s body and how this showed up in my relationships as an adult… And it was a revelation. Ade: Storytelling has always been a core part of how I have expressed myself. For many years I had forgotten this, as I got lost in climbing the corporate ladder. I remember visiting Nigeria in 2010 when my sister reminded me of how I would get the children in our building together at nighttime to tell them a range of stories. Her reflection came at a time when I was feeling dissatisfied with life generally and feeling disconnected from my TRUE Self. I had quit my full time/permanent job to go on a journey of reconnection and rediscovery. As part of that journey, I attended a range of storytelling and improvisation workshops and fell in love all over again with telling stories. This culminated with being on stage last year (and early this year) with guys from The Quest. With my mother passing away last year, I have been remembering my journey with her and I feel pregnant with all these stories that are dying to be born – dying to be told! Paul: Yeah, that’s pretty much how I felt about my father and the story of my relationship with him… it seemed in my memory there were all these jigsaw puzzle pieces that just didn’t add up… I just couldn’t (or wouldn’t) put them together.. I just wasn’t sure what I would find out when I did… when someone dies there is an enigma there… and in my case I didn’t get to say goodbye to my father… so in terms of process there were two core impulses… to try to use story and theatre to piece together the puzzle… and to find the most powerful and creative and healing way I could imagine to say goodbye to my father… and hello to myself as a fatherless son… and to stand back and see and feel the power in that sense of ascendancy – if that makes any sense? Ade: Yes, that does make sense and I can relate. I spent the last 2 years before my mother dying putting together this jigsaw puzzle of our relationship and it got to a point where I started to wonder what had really happened – in terms of truth and imagined truth. In one of my final conversations with my mother, we were talking about an event that had happened in my childhood and we had both remembered it differently. I also witnessed this when I went through the diaries that she had kept where some of the things she had written down did not match how I had remembered it. So for me, preparing for the performance has taken me on this journey of remembering – bringing memories back together; in terms of events and my interpretation of those events. I feel very much like Hansel and Gretel following the breadcrumbs trying to make my way back home, but some of the crumbs have disappeared, so I am sometimes having to guess and re-imagine where they might have been! Paul: Perfect analogy, in fact its the kind of idea I’ve been working on with The Haunting project too with the guys… both The Father+Mother project and that project have, at their core, a fundamental mystery – namely ‘what happened’? – and this is told by a narrator, but there is that question when working with memory and story – can we actually trust the narrator, or are they ‘unreliable’ – as I get older I have begun to understand that what I have previously told as ‘experiences’ are in fact ‘perceptions of that experience’ – even though they happened to me, they happened to me as maybe a 4 year old, but I’m re-telling that as a 47 year old… and in the telling of that story there is a fundamental discomfort… a clash between the ideas and decisions about the world that I made as a child to get through childhood and those of an adult gay man in his 40’s… its a wonderful and creative discomfort though.. a bit like the grit in the oyster.. the pearl here is enlightenment through resolution. Making this piece has allowed me to go back in time to get to feel my 4 year old who still lives inside of me… to allow him voice and expression… to say ‘I understand’… and then when I do, he’s all ok and silent and happy again just because I acknowledged him… as much as I’m honoring my father I’m honoring myself through this process too… and I’m many ways it feels like the ultimate test of everything I have learned as part of my journey with The Quest. 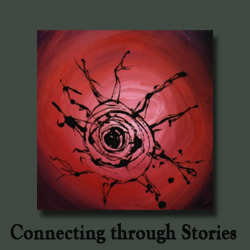 Ade: Yes, autobiographical storytelling for me is often about a variety of things – making sense of the past, healing the wounds of the past, rediscovering how the past has influenced who I am today….. and to entertain the listener! Ultimately as the storyteller, remembering the past allows me to be more fully myself in the present. For I am no longer haunted by my shadows or ghosts. The process has been very much an exorcism! What do you feel the audience will take away from The Fathers + Mothers project? Paul: A fundamental strategy of The Quest is simply to ‘speak from the ‘I’ – because when we generalize it can mean that we attempt to speak for others, and possibly not be fully committed to ourselves and our feelings in the process – but the knock on effect is that when a participant on the courses starts to learn to speak from the ‘I’ – they suddenly become relatable… and in doing so, suddenly I see my experience in their own now that they are owning it with clarity and bravery. On one level this show is just me talking about me and my father as honestly and as authentically as I can… and in doing so I really hope my own investigation into my relationship with my father as a gay HIV+ man will be relatable to anyone that has had a relationship with a parent where its taken a while to be able to understand each other and find peace with them… that’s the hope anyways… and in going there… maybe find some point of hope for change… Because in doing this work I do feel healed, and I do feel really really loved by my father… I don’t think I would have ever truly found that out if I hadn’t taken Tim’s advice and pushed past my own fear to take on this project. Ade: For me the power of autobiographical storytelling is that in the listening we get a glimpse of the Oneness that binds all of us – for on the surface we may be different in terms of what we look like and what may have happened or not happened to us, but beneath it all we are not that much different. Brene Brown in her work says that we are all hardwired for connection and I truly and deeply believe this. And this comes through in both our stories – you and your father, me and my mother – it’s a story of connection, disconnection and everything in between. Ade: I can relate to that. 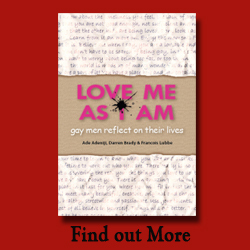 In considering the stories I wanted to bring to the project I was conscious that I wanted to also connect with the many gay men who are not fully accepted by their parents for who they are. Even though we now live in a world that is more embracing on some level, there are still corners of the world where many parents struggle with accepting and celebrating their gay children, and in our youth we may have interpreted that as something to do with us – I know I did! In my longing for connection, I would sacrifice authenticity! And this also applied to my mothers journey… she sacrificed so much for connection. As I think about it now, I’d like the audience to also leave pondering on what they sacrificed in their own pursuit of connection. Ade: Oh, it can certainly be EGO driven and over indulgent, if the storyteller is not mindful – I’d like to feel that we are that, and congruent with where we are in our respective lives. Paul: I’ve got to say I’m really fascinated by the next phase of our project next year when we switch focus and you do a piece about your father and I do mine about my mother… how are you feeling about that prospect? Ade: I’m so immersed in this one that I cannot see that far yet…. but when I do, I am sure that I will be equally excited! Paul: Yeah.. I was talking to The Haunting cast about the challenges of solo shows… I think it would be great to get as many solo shows from Quest graduates out there.. It’s like an ultimate test of authenticity and growth and courage to be yourself…. we are just pioneering the first shows… its over to our graduates next! Ade: Yes, I am sure there will be many more shows to come, after all everyone has a story to tell! I’m really excited about the upcoming shows on 5 and 6 October!!! 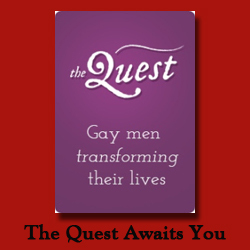 Paul: Yeah me too… It will be great to see as many Quest graduates there as possible to help us through it! It’s been a pleasure talking to you my lovely co-performer! Ade: Likewise…… see you at the next rehearsal! Previous Between Two Worlds Next Being Black and Gay at the same time! Thank you Ade, I would be honoured if you stopped by! And double wow, i love ur creativity and talent reflected across your blog!